Here's a good olive oil week follow-up. Everyone knows olive oil is common in appetizers, salads and entrees. But have you tried it in dessert? That golden-green fruit nectar is creeping onto pastry menus. As I mentioned, I tried olive oil cake in Napa, which I've also tried making (wasn't one my bests, but interesting). This last weekend, I decided I wanted to take it to a truly sacred dessert place: ice cream. Ice cream has certainly been the subject of a lot of experiments of late and, since acquiring an ice cream maker 2 years ago, I've had a lot of fun making homemade flavors like bacon-maple, bourbon-pecan and salted caramel. Yummy! This dish was inspired, in part, by Phoebe Damrosch's description in Service Included of a dessert served at Thomas Keller's New York restaurant Per Se: thyme ice cream, covered with a salted dark chocolate wafer onto which warm olive oil is poured. 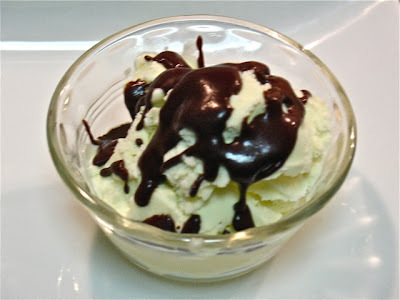 I chickened out at using thyme, but instead decided to make salted olive oil ice cream with a deeply dark chocolate sauce. I turned to Jeni Britton Bauer's trusted Jeni's Splendid Ice Creams at Home Cookbook, which includes recipes for olive oil ice cream with sea-salted pepitas and extra-bitter hot fudge sauce. I used her fudge sauce recipe outright, but made some modifications to the ice cream. Her ice cream technique is a little different. 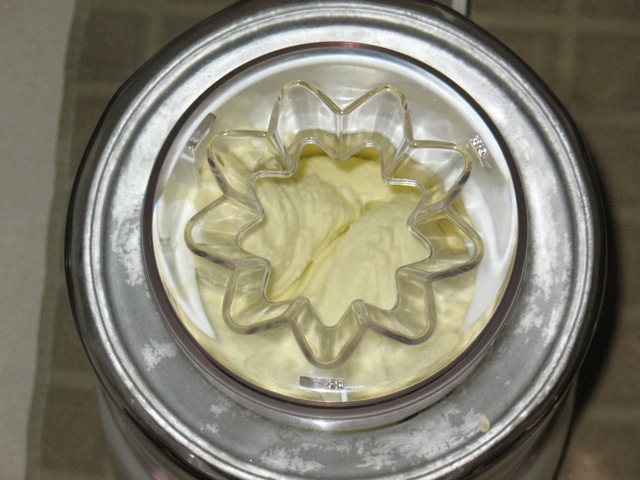 Most homemade ice creams call for egg yolks, making them technically frozen custards, which require the mixture to be cooked to a precise temperature. Too high and the eggs could curdle, too low and they aren't cooked, a potential health risk. Jeni's ice cream doesn't have eggs; instead, it's thickened with cream cheese and cornstarch, which might sound odd, but so far hasn't resulted in any noticeably unusual flavors...other than her ice creams are unusually good. It also means less precision is required, although you have to be careful the cream and milk mixture doesn't boil over. It's best to set everything out before beginning one of her recipes, since once you get started, timing is important. I put the milk and cornstarch slurry in a 1-cup liquid measuring cup and the salt and cream cheese in a large (8-cup) liquid measuring cup, since its spout makes it easy to pour the hot, complete mixture into a large ziplock bag. For my modifications, I omitted the pepitas, since I didn't want them competing with the olive oil and chocolate, doubled the salt, in a nod to the Per Se dish, and I doubled the amount of olive oil her recipe called for, again to put more emphasis on the olive oil flavor. I used Columela extra-virgin olive oil, a well-rounded, full-flavored oil from Spain. 1. 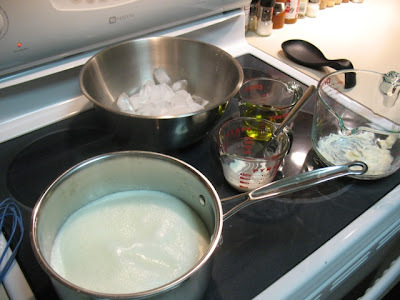 Mix 2 tbsp of the milk with the cornstarch in a small bowl or measuring cup to make a slurry. Combine cream cheese and salt in a large bowl (preferably one with a pour spout). Fill another large bowl with ice and water. 2. Combine the remaining milk, cream, sugar and corn syrup in a 4-quart saucepan. Bring to boil over medium-high heat and boil for 4 minutes (watch carefully to avoid mixture boiling over; if it threatens to, just remove the pan from the heat for a few seconds and stir). Remove from the heat and slowly whisk in the cornstarch slurry. 3. Boil the mixture again over medium-high heat and cook, stirring, for about a minute until slightly thickened. Remove from the heat. Gradually whisk the hot mixture into the cream cheese until smooth. Add the olive oil and whisk until well blended. 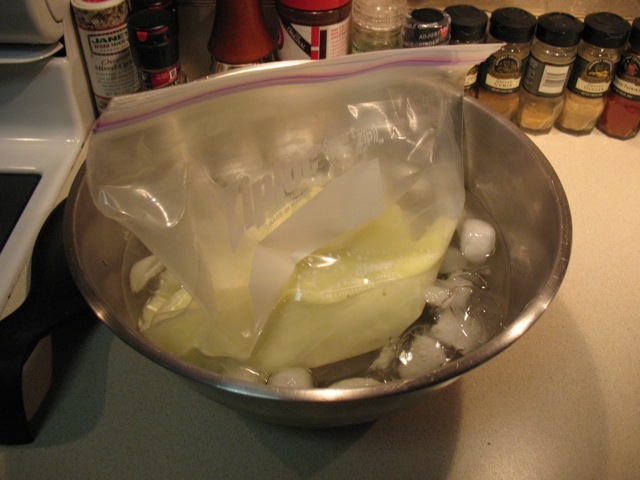 Set a 1-gallon ziplock bag into the ice water bath and pour the hot mixture into the bag. Let stand until cold, about 30 minutes. Transfer to the refrigerator until ready to use. 4. 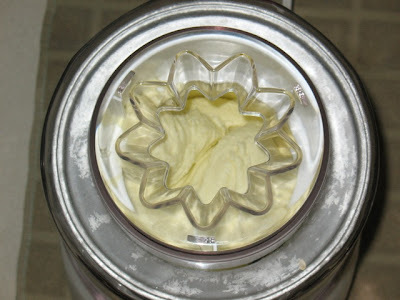 Process the cooled mixture in an ice cream maker according to manufacturer's instructions. Freeze in freezer until firm. 1. Combine the water, sugar and corn syrup in a medium-size saucepan and bring to boil over medium-high heat, stirring to dissolve sugar. Remove from heat and whisk in the cocoa powder until well combined. Add vanilla and whisk until smooth. 2. Add the chopped chocolate and let stand for about 3 minutes. Stir with a spoon or spatula until the chocolate is melted and the sauce has a smooth consistency. Serve warm or refrigerate (it can be rewarmed in the microwave; according to Jeni, it will last in the fridge for 2 months). This was really, really good. The flavors contrasted well. Thanks honey! You're welcome. I'm glad you liked it. This is the sort of experimental dish I was afraid could be a disaster.